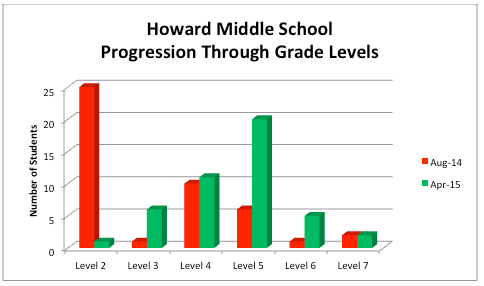 Howard Middle is classified as a Focus School, meaning they have a large achievement gap between the highest-achieving subgroup and the lowest–achieving subgroup. In an effort to increase the math skills of their most-at-risk students and close the achievement gap at Howard, Bibb’s Title I Office selected Ascend Math because it identifies the students’ strengths and needs, and tailors instruction specifically to their deficiencies. Their first year results have been extraordinary! Students averaged 1.5 hours per week working in Ascend Math. Crosby Middle School educators chose Ascend Math for their struggling math students some of whom have never passed a state test. Some of these same students are now passing their district milestones. They are very hopeful for the results they will get back for the state STAAR test. Ascend Math was adopted as a Tier 2 intervention to help fill in gaps that were shown on state testing. Their goal is simple. To pass the state test with a proficient or higher and to match the target scores on the aimsweb MCAP and MCOMP probes. 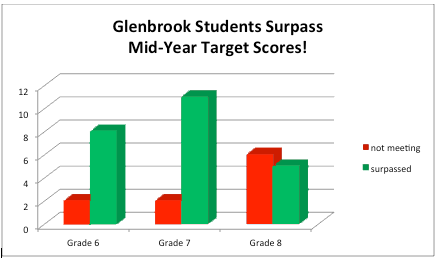 By mid-year the majority of students had far surpassed their target scores! By winter, 80% of 6th graders met or surpassed their target goal on MCAP and MCOMP probes. 85% of 7th graders met or surpassed their target goal on MCAP and MCOMP probes. On average students worked more than an hour a week in Ascend Math averaging more than 24% gains. Educators at Anthony Saville use Ascend Math with a total of 102 students in their math implementation and special education classed. Teachers split time with students between individual instruction and the Ascend math program. The program is vital to identifying weakness to help with our individual instruction. More than 20% of students have shown three or more years growth during the first three quarters of this year. 55% percent have moved up two grade levels. Over 75% leave graduate from the intervention program after one school year or less of support. Cedar Elementary uses the Ascend Math program as a tool for Title One intervention with those students who struggle in math. They schedule student success time daily. They also have a before and after school program available for the students. Pretest to post-test gains in Ascend Math averaged 18% overall. More than 60% have moved up at least one grade level. Students are now engaged in classroom discussions and are better able to follow the classroom curriculum. The educators in Dawson Boyd High School brought Ascend Math into their school to improve math performance particularly on state tests. Students are given one class period a week to work in Ascend, the rest of the time they work on their own. Students completed more than 4100 objectives working in Ascend Math. 19% gained two or more grade levels. Based on an analysis of MSA and MAP data during the spring of 2014, the leadership team at Holabird STEM Program noticed a decline in math scores. They are using Ascend to close functional mathematics gaps in students identified as below grade level through state-mandated testing in order to increase test scores and mathematics proficiency. All students identified as needing additional support in math are placed into the math intervention course, enabling them a double block time for math instruction. Students started an average of 3.05 years below grade level. After 19 hours or more in Ascend, students gained an average of 1.43 grade levels. Kenwood High School uses Ascend Math as a digital component in their Accelerated Math Achievement (AMA) Program which targets approximately 100 grade nine students identified as below grade level in mathematics as determined by middle school Maryland State Assessment scores. Their goal is to provide students with the knowledge and skills necessary to perform on or above grade level with their peers. 74% gained one grade level or more. 38% gained two or more grade levels. 11% of students demonstrated gains of 3 or more grade levels. Students averaged 13.94 hours in Ascend. Lakeside Christian uses Ascend Math for RTI as well as the opportunity for acceleration based on ability level. Their goal is to provide the leveled support each student needs to produce the highest quality product so each child can successfully navigate common core state standards and college and career readiness expectations. Sixth Grade: 63% students improved their level in Ascend. 37% are now working at a level above their actual grade! Seventh Grade: 55% improved their level in Ascend. 41% improved beyond their actual grade! Eight Grade: 50% improved their level in Ascend. 19% have improved beyond their actual grade! LEAP, the Leading Edge Acceleration Program, located in the Las Cruces School District, is a program designed for 6th-8th grade students who are in danger of dropping out of school due to poor attendance, do not respond to a more traditional school environment, or need a smaller school setting to be successful. 30.8% of students have completed one grade level in Ascend Math. 13.5% of students have completed 2 grade levels in Ascend Math. 7.7% of students have completed more than 3 grade levels in Ascend Math. Students averaged 48 hours each in Ascend. In 2013 – 2014 only 48% of students identified below the 25% showed academic growth in Math on the FCAT state assessment. Mill Creek educators chose Ascend Math after reviewing the high success rate of students in the district using the program with fidelity. 53% of students currently using the program are now at grade level. 41% have progressed more than 2 levels. STAR Math standards based assessment results indicate 47% have made significant math gains. Morton High School has used Ascend Math in their special education classroom since October of 2012. SPED students come to Morton with a wide range of ability levels. Small group instruction was not an option due to the wide range of gaps in their mathematical abilities. On average, students experience at least 2 years of growth per school year. Year over year, their teacher sees the gaps in their knowledge base getting smaller as they retain more and more of the information learned. Students are now more confident and competent. At-risk students at Mountain Ridge were found to lack basic math understanding. They adopted Ascend Math to help them get the extra help they need in order to understand the concepts being taught in their core math classes. At-risk students use Ascend Math from 30-45 minutes each week. Improvement in Ascend scores range from 1.9- 37.5%. 79% of their “at risk” students (the ones that use Ascend) passed math last quarter in their regular math classes. Oneida has a high percentage of students working at different academic levels. Traditional RTI programs would not work. They rely upon Ascend Math to provide each and every struggling student with an individualized intervention program. Their goal is to see growth from every student in Tier 2 & 3 math. Students posted a 14% average gain program-wide from pre to post test. Some students gained as much as 63%. 40% have completed one level and moved on to the next level in a 6 week period. Students who were not seeing success in a traditional intervention program, are now seeing positive results. Pine Ridge uses Ascend with their Special Education students that will receive a Special Diploma, meaning they have not met the academic requirements of a Standard Diploma. For them, Ascend Math takes away the ‘one size fits all’ method of teaching and offers an individualized approach to learning. They track their own progress and have taken on a healthy competitive attitude. Educators at Pittsburgh are now in their third year of using Ascend Math with their Tier 3 intervention students. Their students were at different levels with a wide variety of skill gaps. Pittsburgh only had one teacher to help them. Ascend was chosen due to its ability to individualize instruction. 48% of students gained one grade level or more. 28% gained two grade levels or more. Taylor County Elementary has developed a special math program for 4th and 5th grade students scoring lowest on the 2014 Mathematics FCAT scores plus several exceptional education 3rd grade students. Ascend Math is an integral part of this special program. Taylor County Elementary uses Discovery Education Assessment to track progress. 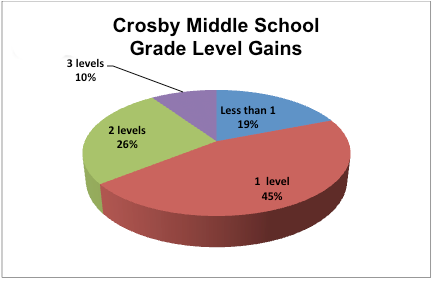 86% of the 4th grade intervention students grew in their scale scores, with 57% moving up one level. 83% of the 5th students had an increase in their scale score with 32% moving up one level. 85% have gained one or more grade levels as of May 1. Educators at Timberlin use Ascend with students in the bottom quartile for math in grades 2, 3, and 4. Most of the students in the bottom quartile are in ESE or have RtI plans. Timberlin adopted Ascend Math after reading the research on it and conducting a successful pilot. 33% of the low performing students have grown by one grade level or more. 7% have grown two grade levels or more. The students have completed more than 525 hours in Ascend. Valley Springs Middle School makes use of Ascend Math to fill students’ learning gaps, build students’ confidence in themselves and their ability to learn skills by creating a growth vs. fixed mindset. Students using Ascend were chosen due to their prior year’s EOG scores. Students participating in the program have shown substantial growth. Several students in the program have scored highest in their class when assessed on common core state standards. West Hills STEM Academy students that use Ascend Math have Individual Education Plans in the area of math. They are also using it as a Response to Intervention. West Hills needed a program that students were motivated to use to help them with their math skills. Students increased an average of 10% in pretest scores to posttest scores. Educators at Williams Middle School use Ascend Math with those students performing below grade level and in need of assistance/practice with their math fundamentals. Their objectives are to raise MCAS scores and improve their MCOMP & MCAP (Aimsweb) scores. Students have more confidence in their math abilities. Students show improvement in recall of multiplication facts since using Flash Card Math. Educators report growth in students’ core math test scores. Worth County’s new school Superintendent found success with Ascend Math in her former district and brought it with her to increase overall student achievement in math. They are looking forward to improvement in their test scores. More than 50% of students have grown one grade level or more. More than 12% have grown two grade levels or more. Students completed over 4800 hours in Ascend.